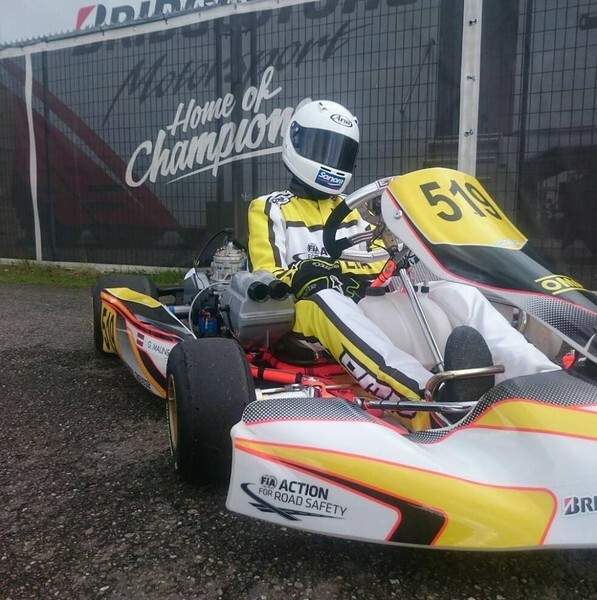 Last weekend, from July 20 to 22, the fourth European Championship and the third final CIK / FIA Academy round, where Latvia was represented by our talented driver Gustavs Māliņš, was held in Alaharm, Finland, on the karting track called Mika Salo. It should also be noted that Gustavs was the only representative of Latvia in these competitions. It is important that the CIK-FIA Carding Academy is special because all the members of the Karting Academy start with one manufacturer's technique. In the course of the race, the engines must change. The fastest riders are learning slow-moving riders and vice versa. This means that the competition in the fight for victory is made as close as possible, as the winner will be determined by the talent of the rider, the team's ability to regulate the technique in accordance with the trail peculiarities and the athlete's requirements. Athletes age - 12 to 15 years. Gustavs coach Dainis Safonovs at the crucial stage: "Before the race to find information about the track, there were doubts about its quality, but it all disappeared when we arrived on the track because it was completely restored with new pavement, track mounds, grass along the track and new safety bands. The track and organization were at the highest level. Just like in the previous stages, Gustavs had only 4 trainings to learn the track, but for us to find the right regulations. All the more complicated were the changing weather conditions and most of the training was on wet track. The results were pretty good from the start, but the competition was getting fiercer by the end." The Saturday had begun quite the opposite. With sunny, warm weather and a dry track, which meant new regulatory searches. Unfortunately, qualifying trips to Gustavs failed as hoped. Dainis admits that it is a thing to be employed in this remainder of the season. After the qualifying trips, the 23th place was won, which meant that the chitches had to start from the 15th place and twice from the 16th place. "The 1st was good, Gustavs stepped to the 10th place in the finish, I would add that there were not many places on the track to cross over, so this was a good result. Unfortunately, the 2nd heet failed because in the second circle, after a little contact with another rider, the disc screw was tightened, as a result of which all the air went out of the tire, and the remaining 6 laps fought not only with competitors, but also with an empty front, left tire and hard-to-handle karting. Result - 17th place. ", says Dainis. On the third day, Gustavs fighted to the 9th place, but the most positive for this race was the set lap time, which was very similar to the speed of the leaders. Adding points to the 23st place for the final race. In total, 34 drivers at the start. The start of the finals failed to make it the best and the big bumpers of the riders lost several places, but on the half way Gustavs had already recovered from the lost and took off from the 27th to the 19th place, but at that moment only two pitfalls were allowed, which rejected several positions back and ran out of rhythm own rider. At the end, however, Gustavs got and went back to the 22nd place, where he also reached the finish, giving a total best of 7th lap time. Looking back at this season, Dainis is in a positive mood. "In general, if we rate this season and exactly the Academy Championship, then it was a great experience and new knowledge both in technical terms and in terms of driving. The results could have been better, especially in the first stage, but for the first such season they were good. The 23rd place in the overall ranking, 51 in the rider competition, which in my opinion is a respectable result, "says Gustavs Māliņš coach Dainis Safonovs. Also, we, karting friends and organizers join the greetings for Gustavs, his team and family. Despite the fact that the final results were not as hoped, we are proud of the Gustavs fight until the last few meters on the race track! Game hosting implies that you also pinpoint far more button for how the server is configured. You can total and murder software, institute updates or squeeze all settings, allowing you to optimize the server for your clear-cut needs. Kindest of all, game hosting contracts commonly secure with rakish and knowing support. The best providers commitment even custodian your server an eye to issues, like failed services, and can time after time arrive at them before you've realized there was a problem [url=https://comparegamehosting.com/game/garrys-mod/]garrys mod server hosting[/url]. Kluczem problemów macierzy [url=http://elizabethsloans.co.uk/teoria-raid-6/]RAID 6[/url] są grupy dysków o specjalnej logice w sterowniku, które składają znane z dodatkowymi bitami, dzięki czemu utrata 1 lub 2 dysków nie niszczy informacji (mówimy tu tylko o stanie raid 5 i 6). Dodatkowe bity – parzystość – umożliwiają odtworzenie utraconych danych poprzez odczytywanie wszystkich informacjach z różnych dysków i napisanie na dysku zastępczym. Problem z RAID 5 polega na owym, że monety są błędy odczytu. Napędy SATA są powszechnie określane z brakiem odczytu błędów (URE) wynoszącym 10 ^ 14. Co oznacza, że raz na 200 000 000 sektorów dysk nie będzie mógł odczytać sektora. Occupation hosting implies that you also seize advance more conduct across how the server is configured. You can add and murder software, institute updates or jerk all settings, allowing you to optimize the server for your specified needs. Kindest of all, game hosting contracts commonly secure with rakish and knowing support. The beat providers determination even scan your server looking for issues, like failed services, and can often organize them in front of you've realized there was a problem [url=https://www.bestrusthosting.com/]bestrusthosting.com[/url]. Сэкс знакомства в любом городе. [url=]temporary email id[/url] As a Hawaii Wedding Photographer and getting a Groom myself I have been by way of the rigors of being in speak to with vendors and obtaining promotions from possible marriage ceremony firms while getting ready for a wedding. Even though I experienced to understand this lesson the hard way, I am offering you this suggestion so you never have to. One of the most beneficial items of tips I can give to any client is to established up a separate short-term e-mail account for your marriage planning and use it to sign-up for keeping in speak to with distributors, contests at bridal expos and anytime you are requesting details from a prospective seller on the web.